MACON, Ill. – Who will be the faster pastor? Can Ryan Little take a commanding lead in the Big Ten Series late model standings? Is Bobby Beiler going to extend his recent winning streak at Macon Speedway? How many former Macon Speedway greats will you remember during the Hall of Fame Driver Reunion? Let’s find out during Kid’s Castle Night at legendary Macon Speedway Saturday, when Big Ten Series late models road around the fifth-mile high-banked oval. The race pays $1,200 to win, and the top five finishers also receive two pit passes to the SuperChevyStores.com 100, as ARCA Racing Series presented by Menards stock cars hit the dirt at the Illinois State Fairgrounds on Aug. 17. Tonight also features the B.G. 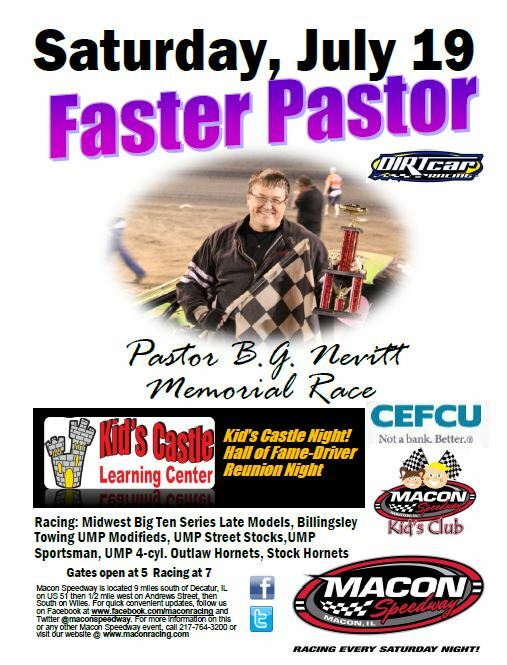 Nevitt Memorial Faster Pastor Race, renamed in honor of B.G. Nevitt, the race’s defending champion and the senior pastor at gtChurch in Decatur before he passed away last summer. Pastor Rick Spangler of gtChurch will attempt to defend Nevitt’s title. He will be joined in the race by Pastor Doug Lowery of Maranatha Assembly of God in Decatur, Pastor J.J. Hairston of Galillee Baptist Church in Decatur, Pastor Richard Chappell of Body of Christ Ministries of Macon, Pastor Rod Hite of Destiny Fellowship in Moweaqua and Pastor Mark Amenda of Mazon United Methodist Church, who returns to his adopted hometown. Macon Speedway invites all former drivers to return to the track for a reunion and a program to recognize its Hall of Fame drivers. Last year’s turnout was great, and Macon Speedway plans to make it bigger and better this year. Former greats such as Roger Drake and Butch Garner will attend. CEFCU Kid’s Club also meets in the pavilion for games and fun. It gives moms and dads a chance to relax for a minute while watching the racing. Kid’s Castle Learning Center has locations in Decatur, Mount Zion and Springfield. The Kid’s Castle philosophy is that children are miracles. We believe that children need to feel safe: safe to explore their world and try new things. Second, they need to feel nurtured. They need to know they are special and unique. CEFCU Kid’s Club will also meet to entertain the kids while moms and dads can concentrate on the racing for a moment. Besides Big Ten late models, Billingsley Towing Modifieds, Street Stocks, Sportsman, Outlaw Hornets and Stock Hornets will also race. Gates open at 5 p.m. with racing at 7. For more information, follow Macon Speedway at (www.maconracing.com), Facebook (www.facebook.com/maconracing) and Twitter (@maconspeedway). It’s easy to join the Macon Speedway text service. Fans can text MSFANS to 74574 to receive fan information. Drivers can text MSDRIVERS to 74574 to receive driver information. Message and data rates may apply. Updates are also available by calling Macon Speedway at 217-764-3000. Macon Speedway is located nine miles south of Decatur on U.S. 51, then 0.6 miles west on Andrews Street and south to 205 N. Wiles.